Disney have solved all of your cash carrying problems, and rolled all of your room keys, park tickets, Disney PhotoPass and fantastic FastPass+ options into one – with the MagicBand. This electronic card or wristband frees guests from carrying around cash or credit cards, and with eight colours to choose from, you can even personalise it. Trust us, these wonderful little creations will make your Disney holiday so much easier. If you like the sound of this all-in-one-device, but don’t know much about it, then look no further because we have answered all of your questions. If you’re staying at a Walt Disney World hotel you’ll automatically receive a wristband. And if you’re staying off-site, you can still receive the same benefits when you purchase your park tickets but, you’ll receive a card instead. Your wristband/card will need to be linked to your Disney account. How do I link My Disney Experience to my MagicBand or card? When you book a stay at a Walt Disney World hotel, your details will be uploaded onto your MagicBand before you even arrive. To activate the MagicBand you’ll need to download the My Disney Experience app. When you create your account you will be prompted to enter your booking details, and once done your details will automatically transfer to your MagicBand. How can I personalise my MagicBand? Depending how far in advance you book your Disney hotel, you’ll either receive your MagicBands in the post or at check-in on arrival. After you’re all booked up, you can log into your online Disney account to choose from a range of colours. But please note, if your band is purchased five days or less before your arrival, you’ll receive a non-customized MagicBand, which is typically grey. When you’re in the parks you might see graphic bands with Tinker Bell and Belle on. Well, the good news is you can purchase these specially designed bands at any Walt Disney World or Disney outlet store. A cast member will then be able to transfer your details to your new MagicBand – yes, it’s really that simple. What does my MagicBand include? Firstly, for those staying in a Disney hotel, your band will let you into your room. But most importantly, it will get you into all the parks, so you don’t need to worry about losing your tickets or rummaging through your bag to find them. A simple tap of the band on a Micky-shaped reader and a fingerprint check are all you need to enter. FastPass+ is one of the best perks of Disney parks, so you’ll be happy to know with a MagicBand you can check in at FastPass+ entrances. Every day you can pre-book Fastpass+ times online on your MyDisneyExperience account, these times will be linked to your MagicBand. Disney has a brilliant photography service called PhotoPass. PhotoPass professional photographers are scattered all over the parks, which means you can visit any photo spot and get great memories of your fabulous holiday. With your MagicBand you can add photos to your online account, so you can either purchase your favourite photos or ask for ‘magic moments’ and download them all. These will be available from your My Disney Experience app for up to 30 days. 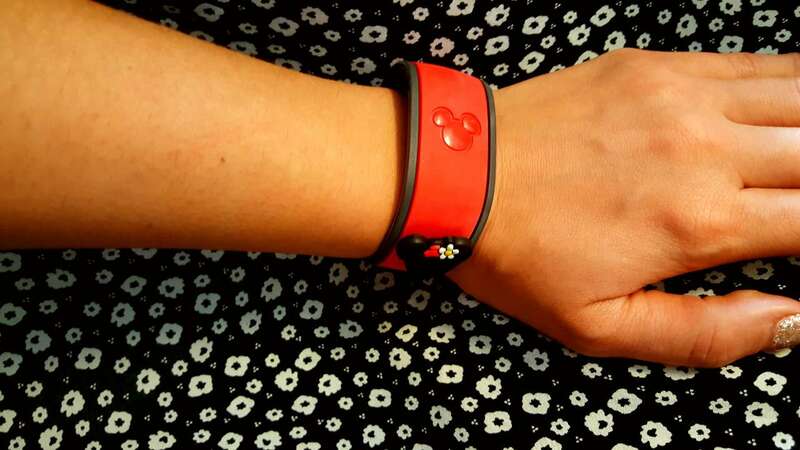 You can also link your MagicBand to your bank card instead of carrying money, wallets or purses. To make a purchase with your MagicBand, all you have to do is tap “Mickey to Mickey” and scan your finger print – it’s a completely secure service so even if you lose your band, your money is safe. This cashless perk is especially beneficial for waterpark days. Can I reuse my MagicBand or card? Yes, if you’re band is still working, you can use it on your next Disney visit. How much does a MagicBand cost? MagicBands can be purchased for $12.95 plus tax when you order them online, or for the same price in resort or any Walt Disney World store. What happens if I lose my band or card? If you happen to lose or misplace your MagicBand, there’s no need to worry. Your wristband can be replaced straight away, simply go to any guest services counter and they will be able to replace it instantly, as well as deactivate your old one for security purposes. If this sounds confusing, cast members are always on hand to help. So, don’t forget to order a MagicBand in time for your next Florida getaway.